holiest shrine in Jerusalem (Creative Commons Attribution). New York (Tadias) – The following piece first appeared in the context of the July 2002 brawl that erupted on the roof of Christianity’s most holy place between Ethiopian and Egyptian monks. “Eleven monks were treated in hospital after a fight broke out for control of the roof of the Church of the Holy Sepulchre in Jerusalem, the traditional site of Jesus’s crucifixion, burial and resurrection”, wrote Alan Philps, a Jerusalem based reporter for the Daily Telegraph. As part of our Ethiopian Millennium series on the relationship between Ethiopia and the African Diaspora, we have selected part of the original article from our archives with a hope that it may generate a healthy discussion on the subject. Easter Sunday. This image is licensed under Creative Commons Attribution. Unknown by much of the world, monks and nuns of the Ethiopian Orthodox Church, have for centuries quietly maintained the only presence by black people in one of Christianity’s holiest sites—the Church of the Holy Sepulchre of Jesus Christ in Jerusalem. 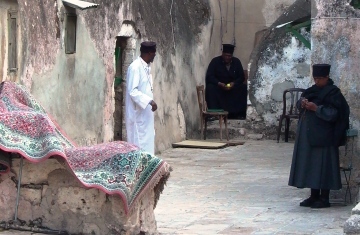 Through the vagaries and vicissitudes of millennial history and landlord changes in Jerusalem and the Middle East region, Ethiopian monks have retained their monastic convent in what has come to be known as Deir Sultan or the Monastery of the Sultan for more than a thousand years. Likewise, others that have their respective presences in the area at different periods include Armenian, Russian, Syrian, Egyptian and Greek Orthodox/Coptic Churches as well as the Holy See. It is hoped that public discussion on this all-important subject will be joined by individuals and groups from all over the world. We hope that others with more detailed and/or first hand knowledge about the subject will join in the discussion. Sepulcher. Photo by Iweze Davidson. Accounts of Ethiopian presence in Jerusalem invoke the Bible to establish the origin of Ethiopian presence in Jerusalem. Accordingly, some Ethiopians refer to the story of the encounter in Jerusalem between Queen of Sheba–believed to have been a ruler in Ethiopia and environs–and King Solomon, cited, for instance, in I Kings 10: 1-13. According to this version, Ethiopia’s presence in the region was already established about 1000 B.C. possibly through land grant to the visiting Queen, and that later transformation into Ethiopian Orthodox Christian monastery is an extension of that same property. Others refer to the New Testament account of Acts 8: 26-40 which relates the conversion to Christianity of the envoy of Ethiopia’s Queen Candace (Hendeke) to Jerusalem in the first century A.D., thereby signaling the early phase of Ethiopia’s adoption of Christianity. This event may have led to the probable establishment of a center of worship in Jerusalem for Ethiopian pilgrims, priests, monks and nuns. Keeping these renditions as a backdrop, what can be said for certain is the following: Ethiopian monastic activities in Jerusalem were observed and reported by contemporary residents and sojourners during the early years of the Christian era. By the time of the Muslim conquest of Jerusalem and the region (634-644 A.D.) khalif Omar is said to have confirmed Ethiopian physical presence in Jerusalem’s Christian holy places, including the Church of St. Helena, which encompasses the Holy Sepulchre of the Lord Jesus Christ. His firman or directive of 636 declared “the Iberian and Abyssinian communities remain there” while also recognizing the rights of other Christian communities to make pilgrimages in the Christian holy places of Jerusalem. Because Jerusalem and the region around it, has been subjected to frequent invasions and changing landlords, stakes in the holy places were often part of the political whims of respective powers that be. Subsequently, upon their conquest of Jerusalem in 1099, the Crusaders had kicked out Orthodox/Coptic monks from the monasteries and installed Augustine monks instead. However, when in 1187 Salaheddin wrested Jerusalem from the Crusaders, he restored the presence of the Ethiopian and other Orthodox/Coptic monks in the holy places. When political powers were not playing havoc with their claims to the holy places, the different Christian sects would often carry on their own internecine conflicts among themselves, at times with violent results. Contemporary records and reports indicate that the Ethiopian presence in the holy places in Jerusalem was rather much more substantial throughout much of the period up to the 18th and 19th centuries. For example, an Italian pilgrim, Barbore Morsini, is cited as having written in 1614 that “the Chapels of St. Mary of Golgotha and of St. Paul…the grotto of David on Mount Sion and an altar at Bethlehem…” among others were in the possession of the Ethiopians. From the 16th to the middle of the 19th centuries, virtually the whole of the Middle East was under the suzerainty of the Ottoman Empire. When one of the Zagwe kings in Ethiopia, King Lalibela (1190-1225), had trouble maintaining unhampered contacts with the monks in Jerusalem, he decided to build a new Jerusalem in his land. 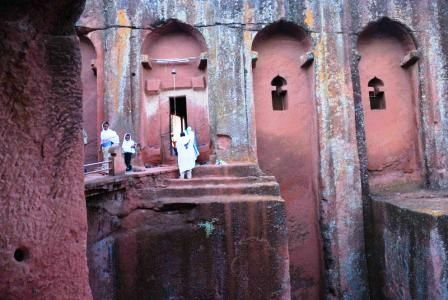 In the process he left behind one of the true architectural wonders known as the Rock-hewn Churches of Lalibela. 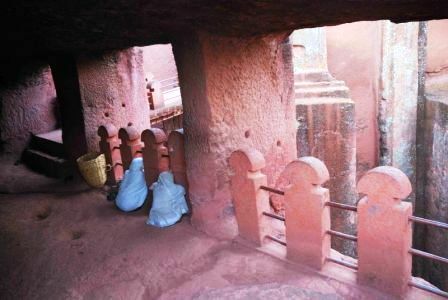 Above: Lalibela. This image is licensed under Creative Commons Attribution. The Ottomans also controlled Egypt and much of the Red Sea littoral and thereby circumscribed Christian Ethiopia’s communication with the outside world, including Jerusalem. Besides, they had also tried but failed to subdue Ethiopia altogether. Though Ethiopia’s independent existence was continuously under duress not only from the Ottomans but also their colonial surrogate, Egypt as well as from the dervishes in the Sudan, the Ethiopian monastery somehow survived during this period. Whenever they could, Ethiopian rulers and other personages as well as church establishments sent subsidies and even bought plots of land where in time churches and residential buildings for Ethiopian pilgrims were built in and around Jerusalem. Church leaders in Jerusalem often represented the Ethiopian Orthodox Church in ecumenical councils and meetings in Florence and other fora. During the 16th and 17th centuries the Ottoman rulers of the region including Palestine and, of course, Jerusalem, tried to stabilize the continuing clamor and bickering among the Christian sects claiming sites in the Christian holy places. To that effect, Ottoman rulers including Sultan Selim I (1512-1520) and Suleiman “the Magnificent” (1520-1566) as well as later ones in the 19th century, issued edicts or firmans regulating and detailing by name which group of monks would be housed where and the protocol governing their respective religious ceremonies. 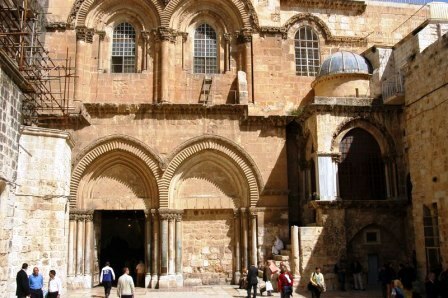 These edicts are called firmans of the Status Quo for all Christian claimants in Jerusalem’s holy places including the Church of the Holy Sepulchre, which came to be called Deir Sultan or the monastery (place) of the Sultan. Ethiopians referred to it endearingly as Debre Sultan. Most observers of the scene in the latter part of the 19th Century as well as honest spokesmen for some of the sects attest to the fact that from time immemorial the Ethiopian monks had pride of place in the Church of the Holy Sepulchre (Deir Sultan). Despite their meager existence and pressures from fellow monks from other countries, the Ethiopian monks survived through the difficult periods their country was going through such as the period of feudal autarchy (1769-1855). Still, in every document or reference since the opening of the Christian era, Ethiopia and Ethiopian monks have been mentioned in connection with Christian holy places in Jerusalem, by all alternating landlords and powers that be in the region. As surrogates of the weakening Ottomans, the Egyptians were temporarily in control of Jerusalem (1831-1840). It was at this time, in 1838, that a plague is said to have occurred in the holy places, which in some mysterious ways of Byzantine proportions, claimed the lives of all Ethiopian monks. The Ethiopians at this time were ensconced in a chapel of the Church of the Holy Sepulchre (Deir Sultan) as well as in other locales nearby. Immediately thereafter, the Egyptian authorities gave the keys of the Church to the Egyptian Coptic monks. The Egyptian ruler, Ibrahim Pasha, then ordered that all thousands of very precious Ethiopian holy books and documents, including historical and ecclesiastical materials related to property deeds and rights, be burned—alleging conveniently that the plague was spawned by the Ethiopian parchments. 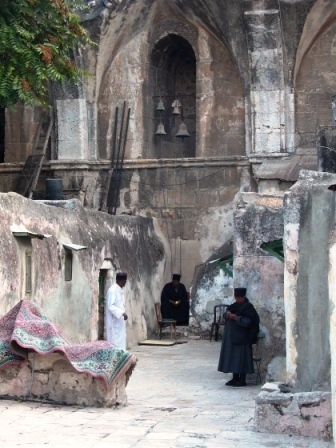 Monasteries are traditionally important hubs of learning and, given its location and its opportunity for interaction with the wider family of Christendom, the Ethiopian monastery in Jerusalem was even more so than others. That is how Ethiopians lost their choice possession in Deir Sultan. By the time other monks arrived in Jerusalem, the Copts claimed their squatter’s rights, the new Ethiopian arrivals were eventually pushed off onto the open rooftop of the church, thanks largely to the machinations of the Egyptian Coptic church. is licensed under Creative Commons Attribution. Although efforts on behalf of Ethiopian monks in Jerusalem started in mid-19th Century with Ras Ali and Dejach Wube, it was the rise of Emperor Tewodros in 1855 in Ethiopia that put the Jerusalem monastery issue back onto international focus. When Ethiopian monks numbering a hundred or so congregated in Jerusalem at the time, the Armenians had assumed superiority in the holy places. The Anglican bishop in Jerusalem then, Bishop Samuel Gobat witnessed the unholy attitude and behavior of the Armenians and the Copts towards their fellow Christian Ethiopians who were trying to reclaim their rights to the holy places in Jerusalem. It was awareness of such indignities suffered by Ethiopian monks in Jerusalem that is said to have impelled Emperor Tewodros to have visions of clearing the path between his domain and Jerusalem from Turkish/Egyptian control, and establishing something more than monastic presence there. In the event, one of the issues that contributed to the clash with British colonialists that consumed his life 1868, was the quest for adequate protection of the Ethiopian monks and their monastery in Jerusalem. Emperor Yohannes IV (1872-1889), the priestly warrior king, used his relatively cordial relations with the British who were holding sway in the region then, to make representations on behalf of the Ethiopian monastery in Jerusalem. 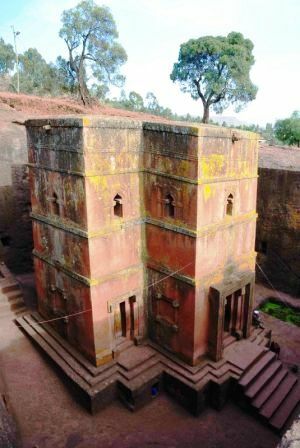 During this period more monasteries, churches and residences were also built by Empresses Tayitu, Zewditu, Menen as well as by several other personages including Afe Negus Nessibu, Dejazmach Balcha, Woizeros Amarech Walelu, Beyenech Gebru, Altayeworq. As of the end of the 19th and the beginning of the 20th Century the numbers of Ethiopian monks and nuns increased and so did overall Ethiopian pilgrimage and presence in Jerusalem. In 1903, Emperor Menelik put $200, 000 thalers in a (Credileone) Bank in the region and ordained that interests from that savings be used exclusively as subsidy for the sustenance of the Ethiopian monks and nuns and the upkeep of Deir Sultan. Emperor Menelik’s 6-point edict also ordained that no one be allowed to draw from the capital in whole or in part. Land was also purchased at various localities and a number of personalities including Empress Tayitu, and later Empress Menen, built churches there. British authorities supported a study on the history of the issue since at least the time of kalifa (Calif) Omar ((636) and correspondences and firmans and reaffirmations of Ethiopian rights in 1852, in an effort to resolve the chronic problems of conflicting claims to the holy sites in Jerusalem. Until the Fascist invasion of Ethiopia in the 1930’s when Mussolini confiscated Ethiopian accounts and possessions everywhere, including in Jerusalem, the Ethiopian presence in Jerusalem had shown some semblance of stability and security, despite continuing intrigues by Copts, Armenians and their overlords in the region. This was a most difficult and trying time for the Ethiopian monks in Jerusalem who were confronted with a situation never experienced in the country’s history, namely its occupation by a foreign power. And, just like some of their compatriots including Church leaders at home, some paid allegiance to the Fascist rulers albeit for the brief (1936-1941) interregnum. Emperor Haile Sellassie was also a notable patron of the monastery cause, and the only monarch to have made several trips to Jerusalem, including en route to his self-exile to London in May, 1936. Since at least the 1950s there was an Ethiopian Association for Jerusalem in Addis Ababa that coordinated annual Easter pilgrimages to Jerusalem. Hundreds of Ethiopians and other persons from Ethiopia and the Diaspora took advantage of its good offices to go there for absolution, supplication or felicitation, and the practice continues today. Against all odds, historical, ecclesiastical and cultural bonding between Ethiopia and Jerusalem waxed over the years. The Ethiopian presence expanded beyond Deir Sultan including also numerous Ethiopian Churches, chapels, convents and properties. This condition required that the Patriarchate of the Ethiopian Orthodox Church designate Jerusalem as a major diocese to be administered under its own Archbishop. baptized. Jan. 1999. Photo by Iweze Davidson. For hundreds of years, the name or concept of Ethiopia has been a beacon for black/African identity liberty and dignity throughout the diaspora. The Biblical (Psalm 68:31) verse , “…Ethiopia shall soon stretch forth her hands unto God” has been universally taken to mean African people, black people at large, stretch out their hands to God (and only to God) in supplication, in felicitation or in absolution. And today, Ethiopian monastic presence in the Church of the Holy Sepulchre or Deir Sultan in Jerusalem, is the only Black presence in the holiest place on earth for Christians. For much of its history, Ethiopian Christianity was largely hemmed in by alternating powers in the region. Likewise, Ethiopia used its own indigenous Ethiopic languages for liturgical and other purposes within its own territorial confines, instead of colonial or other lingua franca used in extended geographical spaces of the globe. For these and other reasons, Ethiopia was not able to communicate effectively with the wider Black world in the past. Given the fact that until recently, most of the Black world within Africa and in the diaspora was also under colonial tutelage or under slavery, it was not easy to appreciate the significance of Ethiopian presence in Jerusalem. 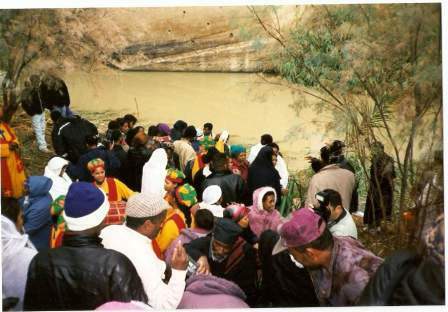 Consequently, even though Ethiopian/Black presence in Jerusalem has been maintained through untold sacrifices for centuries, the rest of the Black world outside of Ethiopia has not taken part in its blessings through pilgrimages to the holy sites and thereby develop concomitant bonding with the Ethiopian monastery in Jerusalem. For nearly two millennia now, the Ethiopian Church and its adherent monks and priests have miraculously maintained custodianship of Deir Sultan, suffering through and surviving all the struggles we have glanced at in these pages. In fact, the survival of Ethiopian/Black presence in Christianity’s holy places in Jerusalem is matched only by the “Survival Ethiopian Independence” itself. Indeed, Ethiopian presence in Deir Sultan represents not just Ethiopian Orthodox Christianity but all African/black Christians of all denominations who value the sacred legacy that the holy places of Jerusalem represent for Christians everywhere. It represents also the affirmation of the fact that Jerusalem is the birthplace of Christianity, just as adherents of Judaism and Islam claim it also. The Ethiopian foothold at the rooftop of the Church of the Holy Sepulchre is the only form of Black presence in Christianity’s holy places of Jerusalem. It ought to be secure, hallowed and sanctified ground by and for all Black folks everywhere who value it. The saga of Deir Sultan also represents part of Ethiopian history and culture. And that too is part of African/black history and culture regardless of religious orientation. Dr. Negussay Ayele is a noted Ethiopian scholar. He is the author of the book Ethiopia and the United States, Volume I, the Season of Courtship, among many other publications. He lives in Los Angeles, California. I really acknowledge your endeavour to disclose those holly antiquities of the Ethiopian Orthodox Church which have remained the Black Identities, too. Your historical notes have inspired me to search for more about the subject under discussion. where is the Ark Of The Covernant? I am very proud of my church EOTC when it comes to her historicity. We are living signs for those who came late to Christianity but departed from it early. But I have a strong concern for the teaching of the church. Now I think we have to think about how the biblical truth can be taught in our church without ignoring the rich traditions we retained from the early days. We have to teach the gospel for the rest of the people where ever they are. We need to carry the cross and go all over the world and preach that it is only through Jesus Christ our LORD and Saviour that sinners get saved; no other way. May the Triune God enrich us with his glory so that we may be live witnesses to his glory. Great appreciation for Dr. Negussie Ayele about the article you wrote in relation to Ethiopian Church monasteries in Jerusalem. 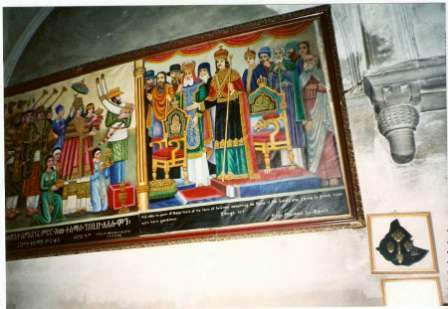 It is right to say that the existence of Ethiopian Church monasteries in Jerusalem represents all black Christians no matter their differences in doctrine.The Ethiopian Church is not only a black church but she is also one of the first early churches established in the first half of the first century A.D. Leave aside the stories of the Apostles’ teachings of Christianity in Ethiopia,it is important to notice the baptism of the Ethiopian minister(Bacos) of queen Candace by Apostle Philip ( Acts 8 : 26 – 40 ). This story confirms that Ethiopia received Christianity at the time of the apostles which is in the first half of the first century. So, a church which has such wonderful history of Christianity should be privileged and honored to have not only its own possessions but also ecumenical recognition of its seniority in pilgrimage to Jerusalem . I think it is time to speak about it. The Ethiopian Church has now good opportunity to speak to its sister churches of Africa since she has every opportunity to say so. May God bless the Ethiopian Orthodox Tewahedo Church for ever.